As hotel marketers involved with social media, we talk a lot about telling our hotels’ stories in unique and personal ways. We seek out content that is authentic and user-generated and jump at the chance to share it with our community of fans and followers. Accordingly, when Facebook announced back in March the mandatory roll-out of the then new Facebook Timeline feature for all brand pages, we proverbally became extremely excited. 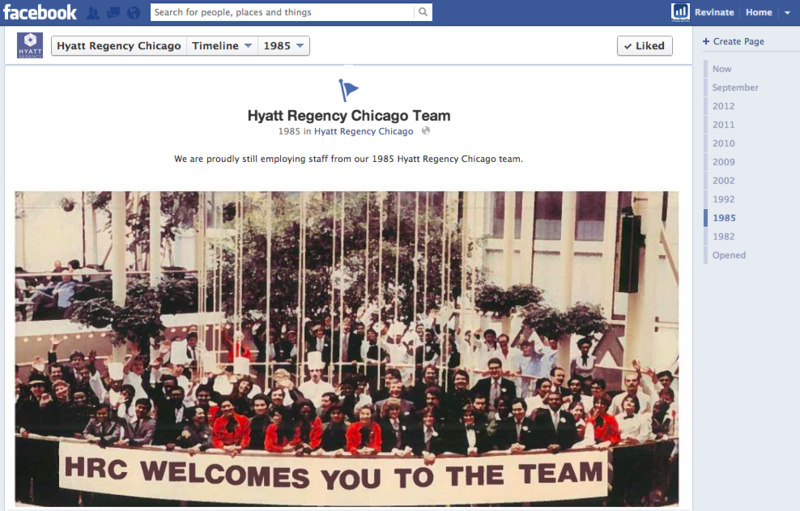 As described by Facebook itself, we would, for the first time, be able to tell our hotels’ unique brand histories in an easily viewable way. While Facebook brand pages have always allowed hospitality marketers to update their fan bases with current, of-the-now content about their respective properties or restaurants, there had never been a way to take a look back at the path to the present. Therefore, it is to my dismay that, as of this writing, the vast majority of properties out there have not yet taken advantage of timeline’s unique ability to tell the storied past. I imagine this is mainly due to marketers at a hotel thinking there are few compelling details to share about the hotel’s past. Not true, I retort! I know that my cousin, for example, had no problem scanning the old family photo album, which included a photo of me as an endearingly awkward youngster, and sharing this content on timeline circa a post dated 1993. I share this anecdote not to embarrass myself, but rather to shed some insight; this photo, while not the most flattering of me, turned out to be the most engaging post shared on my wall that month. The reason why makes intuitive sense: it is inherently human nature to enjoy reminiscing about the past. So why not take advantage at your hotel? 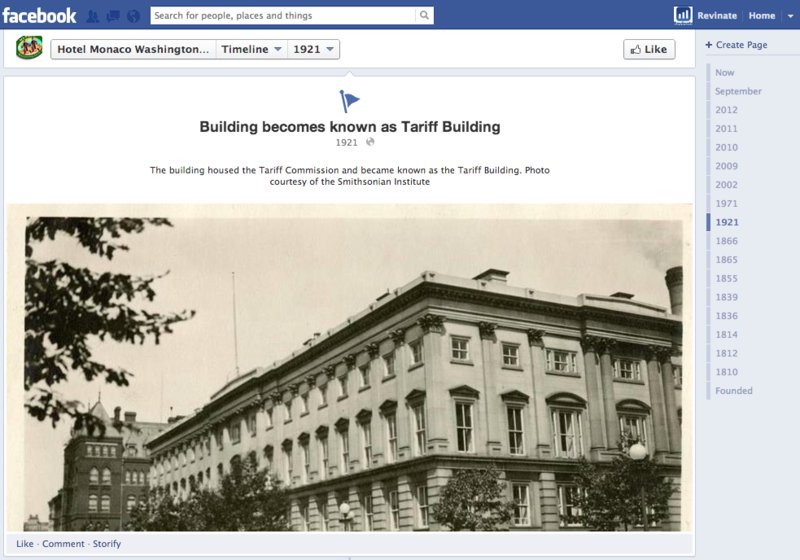 Whether you’re a historic hotel ripe for digitizing the old archives of content or a relatively modern property, I guarantee you there is an opportunity to tell your hotel’s unique history on Timeline. Need some inspiration to get started? Here are a few great customer examples I came across. They range from a nationally preserved landmark hotel to a six year old resort. 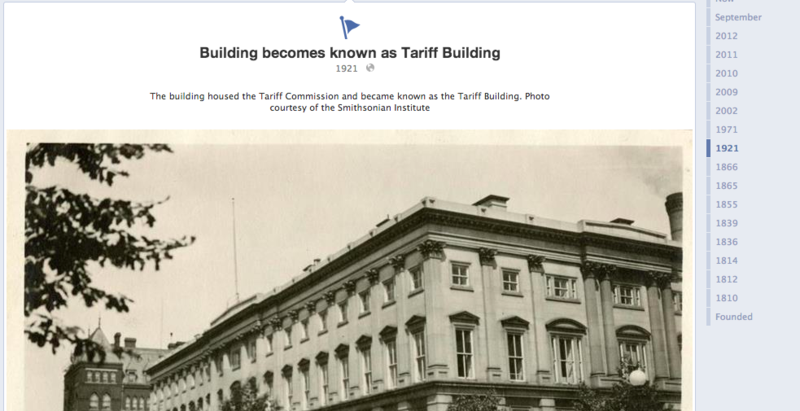 Example #1: Tell Your Building’s Unique History – When the building housing your hotel is a nationally preserved landmark and was previously home to, among other groups, the Tariff Commission, the historic storytelling possibilities are limitless on Timeline. The Hotel Monaco Washington, DC gets this and does a great job at sharing their building’s unique past. Example #2: Dust off the Colleague Photo Album – In a similar example, there’s nothing more engaging than taking a blast from the past and sharing a few old colleague photos from the archives. The Hyatt Regency Chicago does this to excellent effect. Example #3: Highlight Significant Milestones – Sharing hotel awards and accolades in the present is surely a popular practice, so why not also acknowledge past achievements? The Four Seasons Hotel Washington, DC does a fantastic job at this by highlighting their AAA five diamond recognition and fitness center opening. It’s worth mentioning that a Timeline post not included in this example was a photo of Ronald Reagan visiting the hotel the year it opened. While everyone wants to share celebrity guests, you can take advantage of Facebook’s Timeline feature whether or not your hotel attracts “newsworthy” guests or has garnered national attention. Example #4: Showcase Your Property’s Unique Qualities – Just because your hotel or resort property lacks a long history does not mean there isn’t a story to tell. 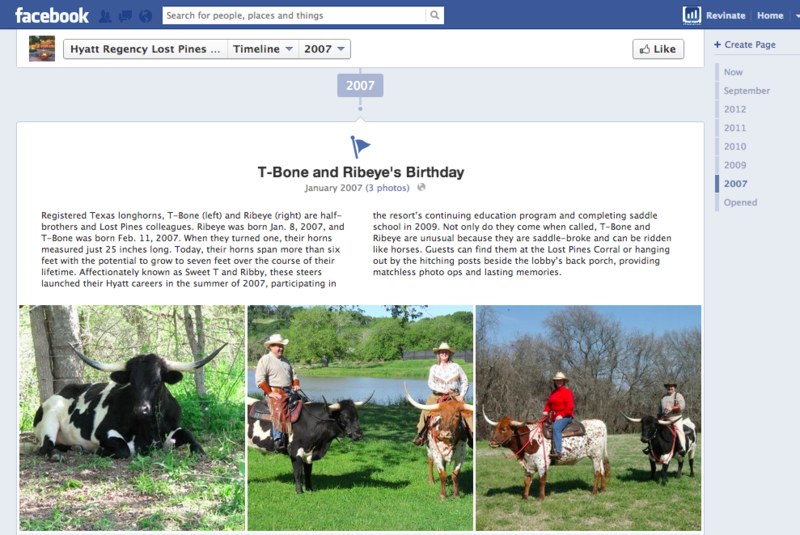 The Hyatt Regency Lost Pines Resort and Spa is proof, using Timeline to share the story of the resort’s most unique features: its resident Texas longhorn bulls. It’s worth mentioning that each of these examples above have the ability via Revinate’s Facebook integration to closely monitor and manage page feedback and engagement. 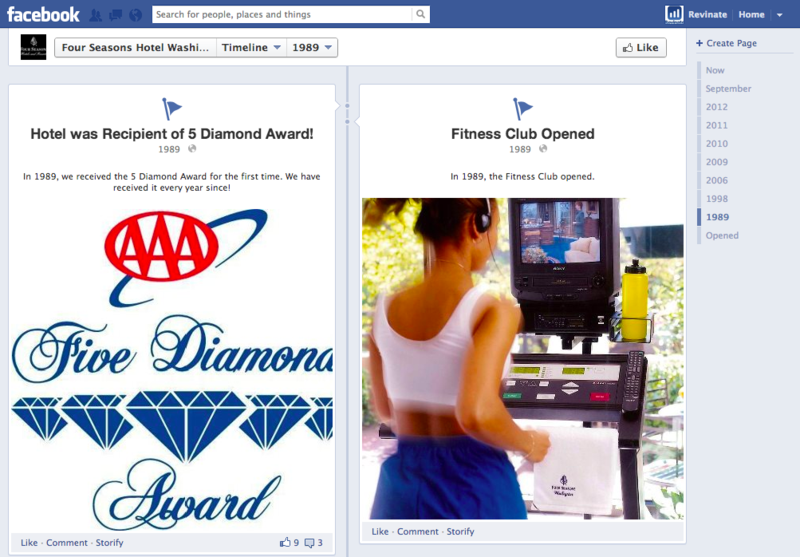 So is your hotel or resort putting Facebook Timeline to effective use? We’d love to share it in a part two to this story! Send us a Facebook message, tweet or e-mail at Greg at Revinate.com and let us know your Timeline success for our next story. We are practicing a good way in marketing Hotel in social media.Now for all your facebook post you can integrate with twitter and it gets updated there automatically. You can share your local city’s stories thereby encouraging tourism and promoting your own city. Sharing culinary pictures and its facts gives an impression to guests about its FnB. There are many ways you can do with the post. But my concern is how do we increase the number of likes as promotions and mailers are not showing good results in return. Thanks Joy for the comment! The best way to approach your social media presence is to treat your efforts as an augmentation of your current marketing strategies. Social media hasn’t replaced the tried and true methods of reaching your customer through traditional and new media, but instead has made it easier for you to receive feedback from and participate in a two-way dialogue with your base. To answer your question directly, I would begin with an email / outreach piece that invites your current customers to engage with you on social. In this piece, make it clear what they (your audience) will get by engaging with you and see where this leads. This is great guide for any hotels to take a look at, far too often they just stick up a Facebook page with no thought or any idea as to what they going to do with it. But the guide can also apply to other businesses, showing that with a little effort you make Facebook an extention of your business and great way to show case it.